Today I absolutely HAD to go to the grocery store to retrieve some “paper products”…just no way to put it off any longer. Procrastination was definitely not an option. So, after giving my lecture this morning, I had a bowl of oatmeal (I try not to go to the grocery store when I’m hungry), and headed out to the store for one item. Well, while I don’t like shopping for some things, I do find it hard to go through the grocery store without meandering around through the produce, fish, seafood, and meat counters, and occasionally (especially around the holidays when they have chocolate cherry bread) the bakery. Today my meandering took me past the meat counter. I usually do check what might be on special–especially when I’ve not decided on that night’s supper–I might well find something that’s not usually in the budget marked down because, while it’s still fine, it’s sell-by date is approaching. Today is wasn’t a “need to move it” but a “manager’s special”. 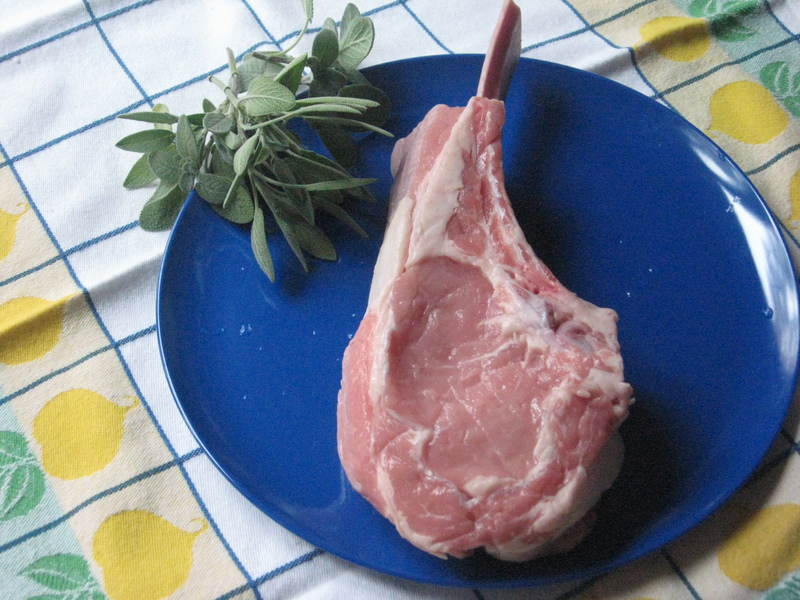 I found a lovely veal rib chop (bone in and thick) as a store special (read cheap for veal). My oatmeal just was not enough to allow me to pass that up–so I came home with a veal chop–since chops of any kind are always wonderful for single-serving cooking. Now, what to do with this chop? The recipe is from Every Night Italian (p. 127) by Giuliano Hazan was the inspiration for this (but could not remember who or where to find it). Thank you, www.EatYourBooks.com! This is so simple that you really don’t need a recipe. Let stand (at room temperature) until your grill is ready–about 30 to 40 minutes. I’ve followed these directions, but I’m a sage lover and I want a bit more sage flavor (even with mild veal) than I get with that standing time, so I’ve tried to find ways to bump up the sage. I’ve tried processing the sage leaves with some olive oil into a nice green slurry and rubbing that on the chop. That works well in you have only a short time to get your sage flavor into the chop–but don’t leave that one more than about an hour or you’ll totally over-sage your chop. Sage is potent even as a fresh herb, some varieties more than others. I would not cook a chop this way if I did not have fresh sage. I’ve gotten the flavor that I want by very coarsely chopping the sage or even just thoroughly bruising the leaves and patting them over my chop, wrapping it in plastic film, and letting it sit in the refrigerator at least over night, or up to one day, and then cooking it. 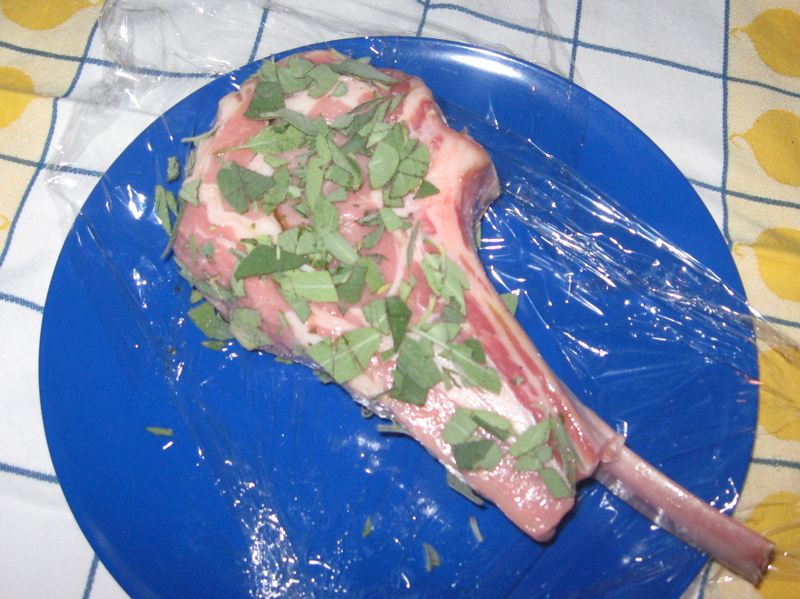 So here’s my chop, rubbed with olive oil covered with the sage leaves, ready to go into the refrigerator until I’m ready to cook in tomorrow evening. Depending on the weather, it will be ready to charcoal grill it, or griddle it, or even pan-sear it. When you’re ready to cook the chop, wipe off the sage leaves. The high heat doesn’t improve the flavor of sage, and can actually burn them, so I like to remove them. You’ll want to salt and pepper the chop as you start to cook it. 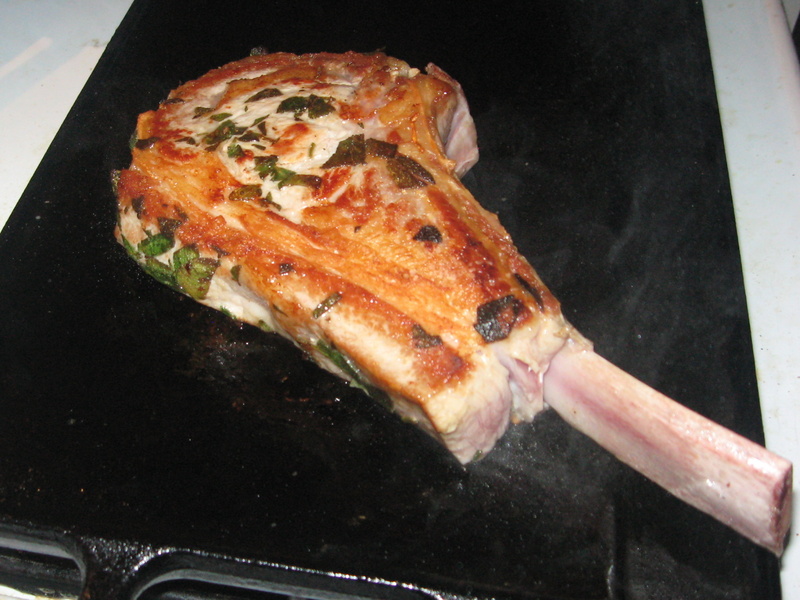 You want to cook the chop to an internal temperature of 130 ° F (medium rare–for my taste) or a bit longer for medium. If you’re cooking on a gas or charcoal grill, you will want to have two-levels of heat–high to start brown the chop, and a lower temperature to finish the cooking since it’s a thick chop. If you are pan-searing you’ll need about 2 tablespoon of oil. Heat the oil over medium-high heat until it starts to smoke, and put your seasoned chop in the pan. Let it cook without moving it for 4 to 5 minutes when it should be browned on one side. Using tongs, flip the chop and reduce the heat to medium and continue cooking until it’s at 130 ° F (or desired doneness). For griddling, I use a cast-iron griddle that fits over two burners–so I can kind of have “two-level” heat with the two burners at different levels. Again, let the chop cook for about 5 minutes without moving it. Once I’ve turned the chop and moved the chop to the somewhat cooler end, I can put veggies on to cook while the chop finishes. (If you’re working on a grill-pan, then adjust the heat as you would for the pan searing, but with the heavy cast iron it does take a bit for the heat to adjust. I ended griddling my chop because it was a damp, rainy day–it was still wonderful. Added a few steamed fingerling potatoes and some sautéed broccoli raab (with garlic and red pepper flakes). It was a fine meal. My site is about [url=http://educationaltoysfortoddlers.blogspot.com/]toys for toddlers[/url]. Awesome. Make me hungry. I think I will look for chicken recipes.